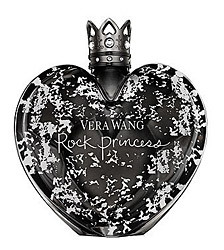 Let’s close off this princess trifecta for now with Vera Wang’s Rock Princess, the grown-up version of Princess and Flower Princess. Add some black to the bottle, amp up the dark notes and get ready to smell. In Bottle: Rock Princess comes off as a fruity floral with a very weird dense foody note backing it up in the bottle. It’s like a mix between sweet, floral, and a really gigantic pile of sweet musk. Applied: Starts off as a heavy fruity scent with a twist of sugar to sweeten it up. The alcohol that’s lingering on the surface of this is a little distracting too, smells a bit like whiskey. The fruits are also watery and while sweet, they’ve been in the bath a little too long. I’m not quite sure this dark, dense deal is really working out in Rock Princess’ favor as the fruits start melting into the florals turning this into a spoiled fruit-like scent. I’m smelling something slightly bitter at this point which is very awkward and kind of unappealing given how sweet the rest of the fragrance is. Rock Princess is a loud fragrance. Appropriate given its name. It’s so loud that one spritz would probably do it for most people as I had thought the original Princess had a decent enough projection. The dry down to Rock Princess is really the best part. Woodsy, with a hint of coconut and that same clean musk. The sugar is dialed down so I’m assuming Rock Princess thinks you’ve had enough after the cake bombardment. Extra: Vera Wang is a very famous fashion designer based in The United States. Most people know her for her elegant and contemporary wedding dress collections. Design: Rock Princess is the same shape and concept as the original Princess. The glass has been painted black though and the topper is now a dark grey. The bottle still pretty much works the same way. I wasn’t feeling Princess or Flower Princess’ bottles for their cutesy heart shape and I’m still not feeling the the design. I think out of all the three Princess fragrances I’ve tried and smelled, Flower Princess is up front in first place, then Princess followed by this Rock Princess deal here. I didn’t find the scent appealing and it seemed like a mish-mash of stuff that didn’t go together very well. There’s a Glam Princess flanker out now too, I think. I’ll be trying that one at some point I’m sure. Reviewed in This Post: Rock Princess, 2009, Eau de Toilette. This entry was posted in floral, Reviews By House, sweet, vera wang and tagged floral, fragrance, heady, heavy, perfume, princess, rock, scent, sweet, vera, wang. Bookmark the permalink.